You have the Western star of 2011 IHSA Nationals and the western star of 2012 IHSA Nationals. 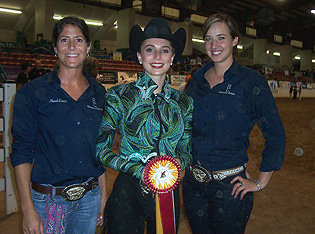 Bekah Irish (on right) won three classes including the individual AQHA Trophy at 2011 Nationals. 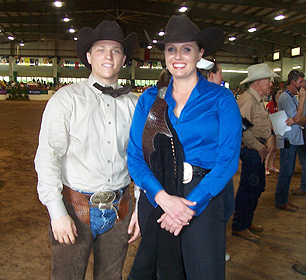 At 2012 Nationals Irish competed only once, the University of Findlay junior placing second to Ohio State's Austin Griffith (on left) in team open reining. Griffith would win two western team classes and the individual AQHA Trophy before the weekend was over. RALEIGH, NC - What do you get when you put Saxons, Vikings, Knights, Spartans, Buckeyes, Cornhuskers, Oilers, Buffaloes and Beavers together? The 2012 IHSA Nationals Western Team Competition, that's what! The Saxons are Alfred University, champions of Zone 2, Region 1 and a survivor of the Ocala, Florida semifinal March 24th and 25th. Alfred came from behind during the final class at Semi's to overtake Florida State and win a tiebreaker for reserve champion team. The Vikings are Berry College, the defending IHSA National Champion Western Team, which survived the Findlay, Ohio Semifinal by overtaking Morehead State during the final team class to place third with 18 points. The Knights are St. Andrews University, which had a chance for high point team honors going into the final class at the Harrington, Delaware semifinal before losing a tiebreaker for second with Ohio State University. The Spartans are Michigan State University, who thanks to a win in the final team class at the Ocala Semifinal jumped over four teams to tie Alfred for second at 18 points each. The Buckeyes are Ohio State University, which was on the brink of missing Nationals for the first time since 1986 when their final two riders at the Harrington Semfinal came up with a first and a third, respectively. This propelled Ohio State to 20 points and Reserve Champion by way of a tiebreaker with St. Andrews. The Cornhuskers are the University of Nebraska at Lincoln, which won the Harrington, Delaware Semifinal with 26 points. Though the Cornhuskers led from the second team class onward they were still not assured a trip to Nationals until Dustin Renken won the final team class (advanced western) to give Nebraska a 26-20 win over both Ohio State and St. Andrews. The Oilers are the University of Findlay, which scored 37 points to win the Semifinal they hosted March 24th and 25th. Findlay scored 37 points, the most of any team at a Semifinal event this season. The Buffaloes (or 'Buffs') are West Texas A & M University, which scored 30 points to place second at the Findlay Semifinal. Woo-Tam-Ooh led after one class and was never really challenged for second place. And the Beavers are Oregon State University, which pulled well ahead through the fifth team class at the Ocala Semifinal. Oregon State scored 26 points to win by eight over both Alfred and Michigan State. Cecilia Shields - Auble of Berry College stands between Vikings head coach Margaret Knight (on left) and first-year assistant coach Allie Jones (on right) following her red ribbon effort in team novice western. The defending National Champions would finish tied for fourth in 2012. 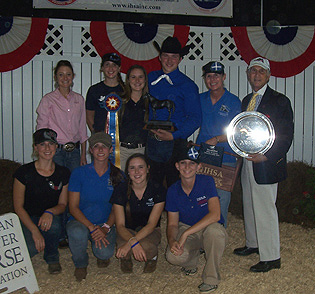 Of the nine teams to qualify for 2012 IHSA Nationals, five were returnees from the 2011 Nationals Western Team Competition. Each of the other four (Alfred, St. Andrews, Michigan State and West Texas A & M) had sent a full western team to Nationals at least once if not more often since 2008. Five of the nine teams had previously won or tied for a Western National Championship. West Texas A & M was co-champion in 2003, Michigan State won titles in 1989 and 1990 (the latter a shared title), Findlay won five titles from 2001 forward, Ohio State has the most championships with nine (only one shared) and Berry won their first-ever title in Lexington one year ago. Could one of the four teams without a previous title do what Berry did the last time out? As has become the norm at Nationals the Western portion of the event did not start until the second day, when Team Open Reining Pattern commenced around 1:00PM on May 4th. Some may not be aware but in the late 1990's the Judge's scores for each reining rider were not announced after their ride. In those days no one knew how the placings would turn out until everyone was back in the ring for the awards presentations (this was also true of hunter seat over fences classes at that time). Today everyone involved in a reining division would hear their score announced by Kenn Marash (the PA announcer at Nationals for the sixth time in seven years). Normally anyone writing down the scores could determine the ribbon each rider would receive. However two riders received a combined score of '136.5' from Judges Gretchen Mathes and Betsy Tuckey, while two others received scores of '0.' Once everyone had completed their pattern riders were invited back to the ring for the presentation of ribbons. Ninth place went to Kristen Liesman of West Texas A & M (a senior, from San Antonio, Texas) while eighth went to Andrea Smith of Berry College (sophomore, from Douglasville, Georgia), each of which had a zero score. Using AQHA rules Smith apparently faired better than Liesman in aspects of the pattern beyond whatever caused each to receive an automatic zero. Seventh place went to Sam Stafford of Michigan State (junior, St. Joseph, Michigan) who received the first proper score of '122.5.' The first team point was earned by Kallie Kayton of the University of Nebraska at Lincoln (freshman, Albion, Nebraska) who received a score of '131' for sixth place. Shannon Leggett (senior, Charles City, Virginia) was fifth for St. Andrews with a score of '136.' The mystery of who the better '136.5' belonged to was settled when Marash announced Elizabeth Whitman of Oregon State (senior, Albany, Oregon) as fourth. This meant that Kalcy O'Keefe of Alfred (senior, Rochester, New York) was the better of the two and the third place ribbon winner. The Reserve Championship went to the rider who dominated 2011 Nationals. Bekah Irish, who at the time was a sophomore at Black Hawk College, won the individual open reining, individual open western horsemanship and the individual AQHA Trophy for the top IHSA western rider. Irish was also second in team open western horsemanship and third in team open reining with a score of '143.5.' Because Black Hawk is only a two-year school Irish had to head elsewhere for a four-year degree. The Acampo, California resident chose Findlay for her junior year. Somewhat surprisingly Irish only competed one time at 2012 Nationals, receiving a score of '140.5' but a higher ribbon than the third she earned a year earlier in team open reining. One other rider was back from the 2011 team open reining division. That rider is Austin Griffith of Ohio State (sophomore, Dublin, Ohio). Though Griffith was fifth last season with a score of '141.5' remarkably he won the division in 2012 with the exact same judge's score! The son of Ohio State coaches Ollie and Debbie Griffith, Austin's blue ribbon was his first at an IHSA Nationals show and it put the Buckeyes into the lead early on. Shortly before 7:00PM Eastern Time the final class of the Friday session took place, Team Novice Western Horsemanship. All but one of the five remaining team classes would basically be run the same way (the Beginner Western Horsemanship division would not include anyone being asked to lope). All nine riders entered the ring and were asked to walk, jog and lope at the appropriate times. Eventually Mathes and Tuckey asked everyone to line up against the rail near the gate and perform the novice pattern one at time (IHSA history trivia: Mathes and Tuckey were the western judges at 2004 IHSA Nationals in Murfreesboro, Tennessee. This marks the first time in IHSA history during the two-judge era which started in 1998 that the exact same two judges were hired to work together a second time at an IHSA Nationals show - Western or English). Eventually all nine riders were finished with the pattern. Riders dismounted, the horse handlers came in to remove the horses, and Marash was set to announce the placings. No 'out of state-ers!' Oregon State University had five different riders entered over six team classes and each of them were from different towns within the state of Oregon, including Katherine Dovenberg (on horse) from the town of Wilsonville. Dovenberg's win in team novice western put the Beavers into the lead through two team classes. Ninth place went to Chelsea O'Diam of Ohio State. From Farmersville, Ohio, Diam was one of six sophomores in the class. Eighth place went to Derek Partridge of Alfred (sophomore, Groveland, New York) while seventh place went to Phoebe Huberty of Michigan State. A sophomore from Portage, Michigan, Huberty was previously the hero at the Ocala, Semifinal as she won the final class which advanced the Spartans to Nationals. Tara Baugher (sophomore, Randolph, Ohio) increased the Findlay total to six with a sixth. Paige Frevert put West Texas A & M on the board as the junior from Glassford, Illinois was fifth. Frevert was yet another former Black Hawk rider (and the team intermediate western champion in 2011) who opted to continue her education while remaining an IHSA rider. Brooke Preston of Nebraska - Lincoln was an old pro at IHSA Nationals. The junior from Firth, Nebraska was fourth for the Cornhuskers, one step back from the third she received in individual intermediate western in 2011 but many steps better than the ninth she received in team intermediate western in 2010. Brittany Powell was the second of two juniors to have competed at each of the previous two IHSA National events. From Huntersville, North Carolina Powell was second in individual intermediate last season and second in team intermediate two seasons ago. This time Powell was third to put St. Andrews into a tie with Findlay with six points each. Berry got on the scoreboard in a big way as Cecilia Shields-Auble was second to put the Vikings right behind Findlay and St. Andrews. The sophomore from Yarmouth, Maine was making her IHSA Nationals debut as was Katherine Dovenberg. A sophomore from Wilsonville, Oregon, Dovenberg put Oregon State into double figures with a first. When not at school Dovenberg trains with Lori Stancik in the Portland area. 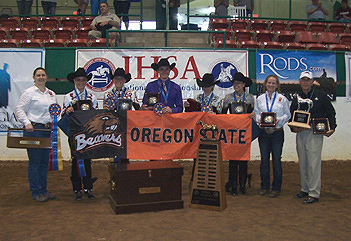 Oregon State was Reserve Champion at several prior IHSA National shows, most recently in 2010. The Beavers were still looking for their first title. Could this be the year? Through two classes it was Oregon State 10, Ohio State 7, Findlay 6, St. Andrews 6, Berry 5, Alfred 4, Nebraska 4, West Texas A & M 2 and Michigan State still looking for their first points. A large chunk of the Saturday session or third day of IHSA Nationals was made up of awards presentations for the hunter seat categories (this as the hunter seat portion of Nationals was over and done by 3:00PM). The annual Parade of Teams also took place, with riders from each Zone entering to the right, walking the circumferance of the arena and exiting where they entered. It was not until after 5:00PM that the only western team class of May 5th took place, and that division was Team Beginner Western Horsemanship. Save for the fact that no one lopped this class was run exactly as the team novice western division the previous evening. When it was over ninth place went to Nicole Mekker of Alfred University (sophomore, Liverpool, New York). Mekker was one of eight riders in the class who was making their IHSA Nationals debut. Though a different rider was listed as competing for the Spartans in the program, Keely DeBusschere (from Traverse City, Michigan) wore number 489 and placed eighth for Michigan State. Emily Almquist (from Houston, Texas) was the first of three freshmen to place in the class, earning a seventh for West Texas A & M. Amanda Young (senior, Holdridge, Nebraska) of the University of Nebraska at Lincoln was sixth, equaling teammate Kayton's ribbon a day earlier. Samantha Brown of Berry College (sophomore, Rome, Georgia) was fifth while Lidia Pedrozo (freshman, Canton, Ohio) put the Buckeyes into double figures with a fourth. Kathryn Sargent (senior, Portland, Oregon) was the only rider in the class to have previously competed at an IHSA Nationals show. While Sargent was out of the ribbons a day earlier in individual walk-trot she was the team beginner western horsemanship champion in Lexington last season. Sargent was third this time to raise the Beaver's total to 14 points. The University of Findlay leapfrogged interstate rival Ohio State (though they are in separate regions) thanks to Talon Archable. The freshman from Carey, Ohio was the reserve champion to give the Oilers 11 points through half the team classes. An uncommon phenomenon nearly took place within the class. Each of the first eight riders to pin was a resident of the state where they go to college. However the only rider in the class not from the same state as his school won the division. Dugan McDermott, a sophomore from Bainbridge, Washington who was second in the division at the Harrington, Delaware semifinal won the class for St. Andrews. With McDermont's win the Knights were only a point off the lead. Could the local team win their first IHSA National Championship? Through three teams classes it was Oregon State 14, St. Andrews 13, Findlay 11, Ohio State 10, Berry 7, Nebraska 5, Alfred 4, West Texas A & M 2 and Michigan State 0. Counting both sections of the reining phase of the individual AQHA Trophy divisions as separate classes there were nine classes held on the final day of 2012 Nationals. The first, third and ninth classes on the Sunday schedule were team classes, and in contrast to 2011 when Berry had a lock on the title through five classes it would not be known until the final class of the 2011-12 season that a new Western Champion would be confirmed. Beginner's luck! St. Andrews University sophomore Dugan McDermott (in cowboy hat) is joined by many Knights teammates, head coach Carla Wennberg (back row, second on right) and IHSA Founder and Executive Director Bob Cacchione (back row, on far right). Dugan won team beginner western horsemanship, the only western team class held on May 5th, to put St. Andrews within a point of first place at the time. Team Advanced Western Horsemanship kicked off the Sunday line-up. Five riders in the division had competed at a previous IHSA Nationals show and several of these riders would score their highest ribbons to date at such a show. Ninth place went to Nolan Solomon of Michigan State (junior, Merrillville, Indiana), who was one of the riders making his IHSA Nationals debut. The same could be said of Jared Deatrick (sophomore, Paulding, Ohio), who placed eighth for Findlay. Casey Duncan was the only freshman in the division. From Stuart's Draft, Virginia Duncan placed seventh for Alfred. Coincidentally all four riders who were making their Nationals debut earned the first four ribbons announced over the PA. Antonia Van Os (sophomore, Birmingham, Alabama) was sixth for Berry, giving the Vikings an additional point. While Kali Cram of St. Andrews had competed at 2011 Nationals (and had already shown twice at 2012 Nationals) it was her first time riding western IHSA Nationals. The junior from Mooresville, North Carolina was fifth, giving the Knights the lead at least until the rest of the advanced western team placings were announced (thanks to her ability to place fourth in team intermediate over fences, Cram received the 'Versatility' award at 2012 Nationals. The award, which is not always given out, goes to the rider who fairs the best between their Western and English efforts over the course of the four days). Amy Mitchem of West Texas A & M had not only competed at a previous IHSA Nationals the senior from Brush Prarie, Washington had competed in the exact same advanced western team class two years earlier! Mitchem, who competed in the Cacchione Cup two days earlier, placed fourth to earn only the second top six placing so far for the Buffs. Mitchem was greatly improved from her 2010 advanced western placing of ninth. Though it was Cole Newman's second IHSA Nationals ride it was his first as a member of Oregon State. Unlike others who were Black Hawk transfers Newman competed at 2011 Nationals as a member of the Linn-Benton Community College team. The junior from Junction City, Oregon was out of the ribbons in individual novice western last season but was third in the advanced team class to raise the Beaver's total to 18 points. Claire Sutton of Ohio State (junior, Perrysburg, Ohio) was the only holdover from the 2011 team advanced western class. Sutton, who won individual novice western at 2011 Nationals but was seventh in team advanced that same year, was the Reserve Champion to move the Buckeyes a point closer to Oregon State. As a freshman Dustin Renken had been third in team novice western. The sophomore from Bertrand, Nebraska won team advanced western to suddenly put the Cornhuskers back in the race. It would not be the last time Renken won on May 6th. He would go undefeated by virtue of a win in individual novice western in the next-to-last class of the day. With the western team competition two-thirds completed five schools were separated by seven points. Though Berry's shot at a second straight title was unlikely at least three schools without a prior IHSA National Championship had a shot! Through four classes it was Oregon State 18, Ohio State 15, St. Andrews 15, Nebraska 12, Findlay 11, Berry 8, West Texas A & M 5, Alfred 4 and Michigan State 0. Following the the first half of the individual AQHA Trophy division's reining phase it was time for the penultimate team class, Team Intermediate Western Horsemanship. To this point three teams (Nebraska, St. Andrews and leader Oregon State) had scored at least a point in every class. The big question was would any of these three teams completely miss the top six and give others chasing them an opportunity to catch up? When the results were announced Valeri Wolf of Ohio State (sophomore, Toledo, Ohio) was ninth. Wolf had been a hero at the Harrington, Semifinal, as her win in intermediate western moved the Buckeyes within a point of third place going into the final team class (Wolf was also the only Ohio State rider to win a team class at Semifinals). Katie Mosca of St. Andrews (freshman, town unknown) was eighth, halting the Knights' run of points in every division. With both Ohio State and St. Andrews remaining at 15 there was a chance many could move up. But would Oregon State pin high? Seventh place went to Christina Olton of Michigan State. The Spartans were still not on the board, frustratingly with three sevenths as their best ribbon and only one chance left to avoid a shutout. Mary Hanner (junior, Guffey, Colorado) was sixth for West Texas A & M. Hanner had prevously competed in two hunter seat classes at 2010 Nationals. Savannah Runnells of the University of Findlay (freshman, Goodrich, Michigan) was fifth to raise Findlay's total to 13. Alfred earned team points for only the second time at 2012 Nationals. Erika Miller (freshman, Perry, New York) was fourth to boost the Saxons over the Buffs for the time being. Amy Cherry of Berry College was second in team beginner western during the Vikings' National Championship outing last season. This time the senior from Chatham, New Hampshire was third to keep alive hopes of a reserve championship. Everyone wondered where Oregon State would place. Danielle Lorenz (sophomore, Banks, Oregon) was the next to hear her name. This gave the Beavers 23 points and mathematically eliminated the entire field save for one school. That school is the University of Nebraska at Lincoln, and thanks to Blake Preston (freshman, Firth, Nebraska) following Renken into the winner's circle the Cornhuskers had rallied from five points through three classes to 19 points through five. Preston's Nationals debut made certain that the final team class of the season would have meaning. Through five: The Beavers 23, the Cornhuskers 19, the Buckeyes 15, the Knights 15, the Oilers 13, the Vikings 12, the Saxons 7, the Buffs 6 and the Spartans 0. University of Nebraska at Lincoln head coach Lori Jaxien (holding tack box) saw her Cornhuskers go from sixth place through three classes to second place through five thanks in part to a first in team intermediate western by Blake Preston (on horse). UNL riders won the first two team classes on May 6th which meant that the Cornhuskers were one of only two teams alive for the 2012 National Championship going into the final team class. Though it was certain that either the Beavers or Cornhuskers would win their first-ever IHSA National Championship there was still a respectable battle for the reserve championship should Nebraska not fair well in the final class. Ohio State and St. Andrews were only four behind while Findlay could get it with a bizzare set of circumstances. Berry could tie for it (or be part of up to a three-way tie). In any event Oregon State would need only a fourth or higher from Whitman to assure no worse than a tie for the National Championship. During the time between team intermediate western and the final class of the day, Team Open Western Horsemanship the individual AQHA Trophy class was completed. Four of the top seven riders in the division which determines the IHSA's top individual western rider for the season coincidentally were entered in team open western. Of the four Griffith had faired best, winning the individual AQHA just as he won the team open reining class two days earlier. Whitman, who was the only rider in the team classes to have competed at each of the four most recent IHSA Nationals shows (including 2009 Nationals in Murfreesboro, Tennessee), was fifth in the individual AQHA. Whitman was also the only rider to compete in five western classes at 2012 Nationals. To this moment her best ribbon in Raleigh was a third in individual open western horsemanship. Whitman had finished no lower than sixth (in individual open reining). All eyes were on the senior from Albany, Oregon as it was her performance that would be the one to beat. The Team Open Western Horsemanship division contained only three riders common to the team open reining two days earlier (Whitman, Griffith and Smith). Jarrod Bush, a Findlay senior from Millersport, Ohio who had finished ahead of Irish in the Zone 6, Region 1 open rider standings, would ride in the final class of the day (and season). Bush had finished fourth in the individual AQHA Trophy. Hali Jorgensen, a junior from Omaha, Nebraska who was seventh in the individual AQHA would show in the division for the Cornhuskers. The division was run like the others, though during each pattern the arena was considerably quieter than usual. Eventually all nine riders were finished, the horsehandlers removed the horses and Kenn Marash was set to announce the final results of the 2011-12 season. Oregon State had come close before but on May 6th the Beavers finally won the top prize. The school with the full team which traveled the furthest to get to the Hunt Horse Complex in Raleigh, North Carolina would take home the AQHA Trophy as the IHSA's top western program for 2011-12. Coach Dawn Ross's Beavers (Ross is second on right) won Nationals by a 24-22 score over Ohio State. Ninth place went to Alexa Buckheit of Alfred University. From Mansfield, Pennsylvania Buckheit was the only freshman in this class. With Buckheit below sixth Alfred finished their second-ever IHSA Nationals team competition with seven points. Eighth place sealed the verdict, as Jorgensen earned this ribbon to lock the Cornhusker's total at 19 points. Still Nebraska set a new 'best' score at Nationals, removing their 13 point effort in 2007 at the Big E in West Springfield, Massachusetts from the record books. For the fourth time in six classes a Michigan State rider was seventh. Marley Martin (junior, Traverse City, Michigan) was the purple-ribbon winner for the Spartans who were sadly the first western team since 2006 to be shut out (four schools were shut out at 2006 Nationals in Harrisburg, Pennsylvania; This was the final season before the Semifinals format was introduced and thus 18 teams were entered in the 2006 Western Team Competition). Whitman was sixth in her final undergraduate ride, closing out Oregon State's total at 24. The Beavers could begin celebrating as soon as she left the ring. Michelle Hustad of St. Andrews (sophomore, Scottsdale, Arizona) was fifth, raising the Knights' total to 17. Bush was fourth to close out the Findlay scoring at 16. Julia Roberts, a West Texas A & M sophomore from Clovis, New Mexico who was second in individual advanced western earlier in the day placed third for the Buffs. This allowed the school from Canyon, Texas to reach double figures and ten points. Smith was much improved over her team reining effort, earning the reserve championship to boost Berry's total to 17. This ultimately put the defending National Champions in a tie with St. Andrews for fourth place (considering that the Vikings lost legendary open rider Allie Jones to graduation the odds on a repeat were questionable. Jones is now the assistant coach to Berry head coach Margaret Knight). Thanks to Griffith the Buckeyes jumped up from 15 to 22 points. Austin Griffith finished the long weekend with three firsts and a second (to Findlay's Ashley Frappier in individual open western) to clearly be the star of the 2012 Nationals western divisions. When the team awards were given out the 'OSU's' were champion and reserve champion (this is not the first time this could be said though it is the first time it refers to the combination of Oregon State University and Ohio State University. In 2000 the National Champion was Oklahoma State University with 25 points while Ohio State was reserve with 21 - Editor). Over the weekend a St. Lawrence University hunter seat team which had not won a National Championship in over three decades - but had been reserve several times - won one team championship while Oregon State finally overcame their prior high of second to claim their first IHSA Team National Championship of any kind. Ohio State, on the short end of a 24-22 score, could claim to have been first or second in the Nationals Western Team Competition at least 15 times since winning for the first time in 1991. The University of Nebraska at Lincoln was third with 19, as previously stated their new program best. For the first time since 2002 and 2003 there have been back-to-back seasons where the high point team was Western National Champion for the first time in program history. In 2002 Texas A & M shared the championship with Ohio State while in 2003 West Texas A & M shared the championship with Texas A & M. Does this mean the rein of Ohio State and Findlay being the favorites to win every season is over? Probably not, but for the short term one cannot help but believe the western team race at Nationals has become far more wide open than it was from roughly 2006 to the current season. The 2012 IHSA Nationals Western Team Class-by-Class Results, held at the James B. Hunt Horse Complex in Raleigh, North Carolina. The first two classes listed were held Friday, May 4th, the third class was held Saturday, May 5th and the final three classes were held on Sunday, May 6th. 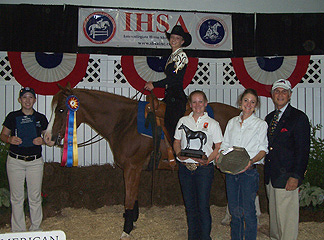 The Judges for all 2012 IHSA Nationals western classes were Gretchen Mathes and Betsy Tuckey. 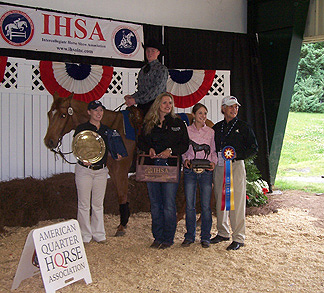 The IHSA Nationals Western Team Competition was sponsored by the American Quarter Horse Association (AQHA). AQHA Open Reining: 1. Austin Griffith, Ohio State University. 2. Bekah Irish, University of Findlay. 3. Kalcy O'Keefe, Alfred University. 4. Elizabeth Whitman, Oregon State University. 5. Shannon Leggett, St. Andrews University. 6. Kallie Kayton, University of Nebraska at Lincoln. 7. Sam Stafford, Michigan State University. 8. Andrea Smith, Berry College. 9. Kristen Liesman, West Texas A & M University. AQHA Novice Western Horsemanship: 1. Katherine Dovenberg, Oregon State University. 2. Cecilia Shields - Auble, Berry College. 3. Brittany Powell, St. Andrews University. 4. Brooke Preston, University of Nebraska at Lincoln. 5. Paige Frevert, West Texas A & M University. 6. Tara Baugher, University of Findlay. 7. Phoebe Huberty, Michigan State University. 8. Derek Partridge, Alfred University. 9. Chelsea O'Diam, Ohio State University. AQHA Beginner Western Horsemanship: 1. Dugan McDermott, St. Andrews University. 2. Talon Archable, University of Findlay. 3. Kathryn Sargent, Oregon State University. 4. Lidia Pedrozo, Ohio State University. 5. Samantha Brown, Berry College. 6. Amanda Young, University of Nebraska at Lincoln. 7. Emily Almquist, West Texas A & M University. 8. Keely Debusschere, Michigan State University. 9. Nicole Mekker, Alfred University. AQHA Advanced Western Horsemanship: 1. Dustin Renken, University of Nebraska at Lincoln. 2. Claire Sutton, Ohio State University. 3. Cole Newman, Oregon State University. 4. Amy Mitchem, West Texas A & M University. 5. Kali Cram, St. Andrews University. 6. Antonia Van Os, Berry College. 7. Casey Duncan, Alfred University. 8. Jared Deatrick, University of Findlay. 9. Nolan Solomon, Michgan State University. AQHA Intermediate Western Horsemanship: 1. Blake Preston, University of Nebraska at Lincoln. 2. Danielle Lorenz, Oregon State University. 3. Amy Cherry, Berry College. 4. Erika Miller, Alfred University. 5. Savannah Runnells, University of Findlay. 6. Mary Hanner, West Texas A & M University. 7. Christina Olton, Michigan State University. 8. Katie Mosca, St. Andrews University. 9. Valeri Wolf, Ohio State University. AQHA Open Western Horsemanship: 1. Austin Griffith, Ohio State University. 2. Andrea Smith, Berry College. 3. Julia Roberts, West Texas A & M University. 4. Jarrod Bush, University of Findlay. 5. Michelle Hustad, St. Andrews University. 6. Elizabeth Whitman, Oregon State University. 7. Marley Martin, Michigan State University. 8. Hali Jorgensen, University of Nebraska at Lincoln. 9. Alexa Buckheit, Alfred University.